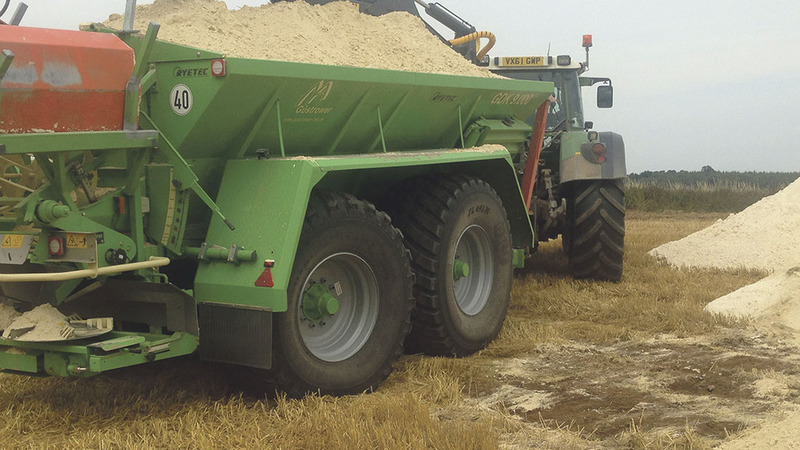 Lime and fertiliser specialist Andrew Dutton has sourced a bulk spreader to precisely meet the needs of his high output contracting business. Jane Carley reports. A Gustrower bulk spreader has been specified by Andrew and David Dutton Ltd to meet the needs of their business. The need to expand spreading capacity, and specify a spreader to exacting standards, led specialist contractors Andrew and David Dutton to purchase a Gustrower bulk spreader from Ryetec. 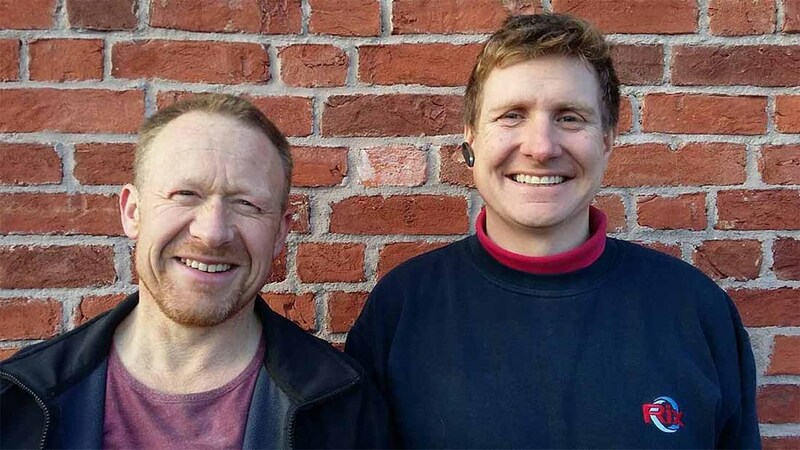 Based near Shrewsbury, Shropshire, Andrew Dutton works with his father David and operator Graham Simcox, providing a full lime and fertiliser service, from GPS soil sampling and advice to supply and application, all within a 50 mile radius. The company also fabricates and supplies hardened vanes and discs for Bredal spreaders. A pair of Bredal bulk spreaders are also on duty carrying out P and K applications and all machines are fitted with a self-loading crane. Andrew Dutton (left) and operator Graham Simcox. 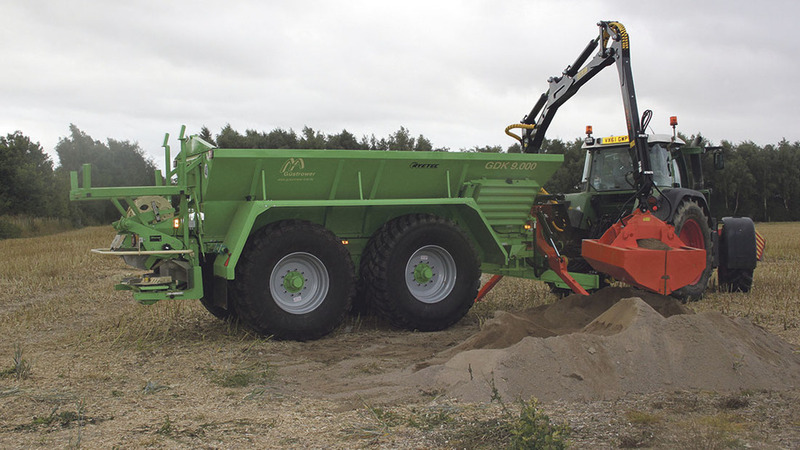 Arriving in last summer, the Gustrower GDK 9000 was primarily chosen for its 16 tonne, 9cu.m capacity and tandem axles. Mr Dutton explains; “Gustrower was the only company that could supply a tandem axle machine to spread the extra weight, and was happy to adapt it to our design, with a steering rear axle and suspension. 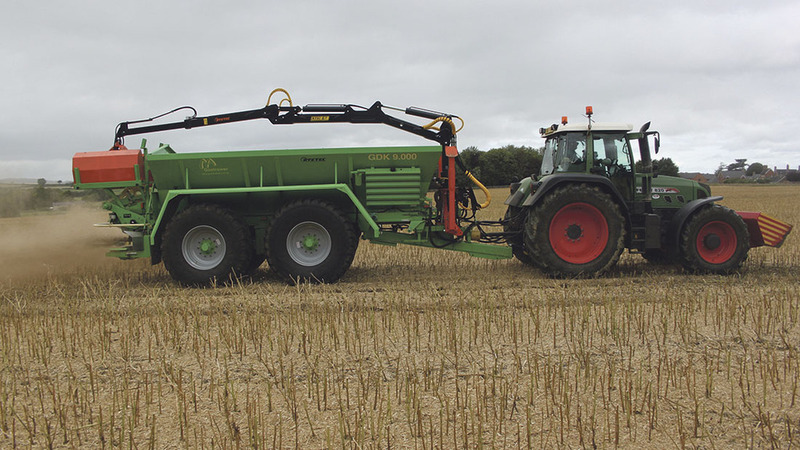 Lime is fed to the spinning discs via a chain and slat conveyor rather than the rubber belt used on other two machines, and Mr Dutton comments that this gives a more positive feed which is especially effective on wet material. A pair of spinning discs spread to 15m wide, with a border spreading system fitted for use when spreading fertiliser. Mr Dutton comments that they offer plenty of adjustment, which comes in handy with the highly variable quality and consistency of lime, plus changeable weather which can affect spreading characteristics. Wide tyres were specified for the suspended, steering tandem axle – they are slightly smaller on the rear axles to allow for turning. “Jobs vary, but I would expect to get another 30-40t/day compared to the Bredal,” says Mr Dutton. The loading crane is an essential part of the armoury, and while Mr Dutton has always sourced and fitted his own Botex cranes previously, he decided to try a KTS crane from the range of forestry equipment supplied by Ryetec. A KTS loading crane has been fitted to give a self-contained supply and apply service. He adds that while the machines work a long season these days – energy crops boosting the spring workload – and are flat out after harvest, they are relatively simple and need little maintenance.